There are so many pedals options to choose from. Here’s the run-down of the most comfortable clipless pedals that every beginner cyclist needs to know about. For a long time, I just used toe cages. After all, if people have been biking for hundreds of years without any expensive pedals, why should I have to shell out the money for them? I actually completed my first century (100 mile ride) in nothing but tennis shoes with toe cages. First, What are clipless pedals? Ironically, clipless pedals are pedals that you “clip” into. And we just go along with it. After all, when you’re pedaling, it doesn’t matter, right? Clipless pedals were first introduced by LOOK back in the 1980s. Not surprisingly, they have become the hottest thing in cycling. Cycling shoes are extremely stiff. After all, they are made for pedaling — not for walking in. When you pedal in tennis shoes, the pedals dig into the soft sole of the shoe, pressing primarily on the metatarsals – those small bones at the base of the toes. All of the power has to be directed through this small area, and, consequently, a lot of power is lost. Because cycling shoes are so stiff, they deliver power from the entire ankle and foot and enable an evener power distribution. This not only helps eliminate foot pain, but it also helps reduce the amount of energy that is lost in the soft sole of other shoes. So, with clipless pedals, you are essential, turning your entire foot into a pedal, delivering a more powerful stroke and creating a more comfortable ride for yourself. Probably the best thing about clipless pedals is that you can pull up on the upstroke. Most riders just push their pedals. However, by pulling up on the pedals, you use more of your leg muscle, creating a better workout for yourself. With practice, you can develop phenomenal increases in speed by developing the upper muscles of your thigh. The ability to pull up during the upstroke is especially essential for hill climbing and can make all of the difference between a successful hill ascent and a painful one. Here are some likely assumptions for a beginning road cyclist who is looking to go clipless. 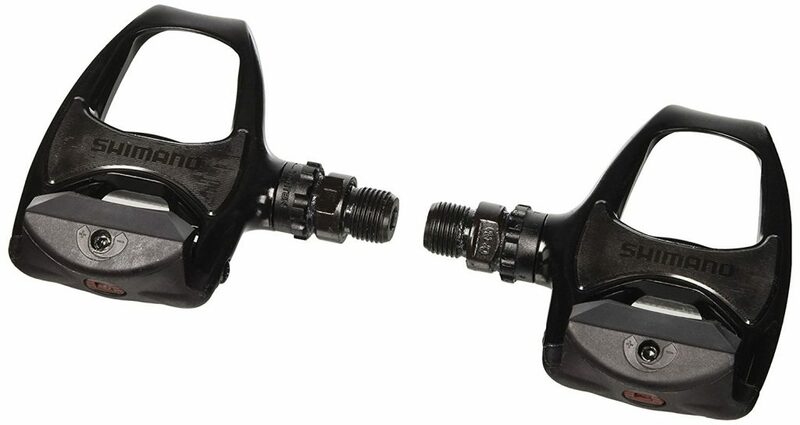 I have two major favorites when it comes to road bike pedals: Shimano and Speedplay. The Shimano pedal is excellent because it uses the original LOOK clipless pedal format, which gives you a huge clip for solid power transfer. At the same time, the road pedals are easily adjusted by a small screw on the rear so you can make them easier or harder to clip out of. New riders can make the pedals very loose and give themselves the extra confidence that they can clip out easily. As they become more confident, they can tighten them down and deliver more power without clipping out accidentally. 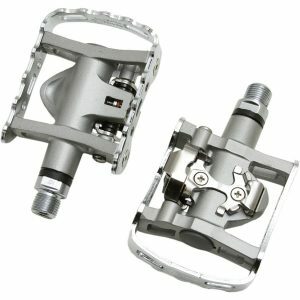 Probably the best aspect of Shimano road pedals is that they are some of the cheapest pedals out there. Plus, they are high-quality and will last you through years of use. Plus the cleats — the parts that have to be replaced the most — are very inexpensive. And, if you like the cheap Shimano pedals, you can always upgrade to a better pair later. They have many different varieties in the road line, and they just keep getting lighter, with better mechanisms (the better innards both help with durability as well as making it easier to clip in and out). This is probably the most widely used road pedal, and you can’t go wrong going with Shimano. They’re top-notch. These Work Great On Road Bikes, too! Mountain bikes use a much smaller cleat. This enables the mountain bike shoes to have a little tread on them around the cleat. It helps during those inevitable moments when you have to hike out of some tricky situation. Plus, road cyclists like them since they can more easily walk around — nice when stopping by the coffee shop after a ride — and commuters love them since it gives them a shoe that is more universal for all the situations they will find themselves in. There is only one good pedal for beginners to look at: The Shimano SPD. SPD’s are so easy to learn, install, and use that it’s almost a joke. Plus, if you have SPD cleats on your shoes, you can use them at pretty much any spinning class nationwide. In fact, SPD cleats are so popular that even most beginning road cyclists will use them instead of going for a road pedal. The one downside is that the pedal is so small that you don’t have quite as much power transfer as you would with a road pedal. However, until you decide to do a Tour de France, it probably won’t matter to you, anyhow.